What happens if you split at index 0? Ah, the left vector is empty! That’s because Vector.splitAt starts the right vector at the given index. There’s nothing before the given index, so the only thing left to return for left is an empty vector. But what happens if you try to split at an index greater than the length? Well, that’s interesting. So then, if you split at any index greater than the length of the input vector, the left contains the input vector while the right vector is empty. You can use Vector.splitAt in performing a merge sort. Vector.splitAt is, admittedly, a pretty small piece of the puzzle. Merge sort is a divide-and-conquer algorithm, and Vector.splitAt just performs the divide part. Nevertheless it comes in handy for that part. // the non-empty side to the accumulator. // accumulator. Then call recursively. A quick announcement: I’ve got some instructional material to develop. Unfortunately it’s going to take up a fair amount of my time. This is probably the last Scala Saturday post for a little while, but I hope to pick back up in a month or two. Sometimes you have a collection of items that you want to group according to some common property or key. Stream.groupBy can do that job for you. It takes that collection and returns a map keyed to that grouping key. The value for each key is the sequence of all the items that fall into that group. That’s a little hard to follow. So what’s it useful for? But that’s OK, right? What’s the difference, really? The value π is one thing: it’s a universally recognized constant. But even with the example delta above, don’t you want to name it something more descriptive, like marginOfError anyway? What’s the point of this post then? Sure, you can use “special” characters in variable names, but so far, I’ve discouraged you from doing it! Nevertheless there are times when it is appropriate. 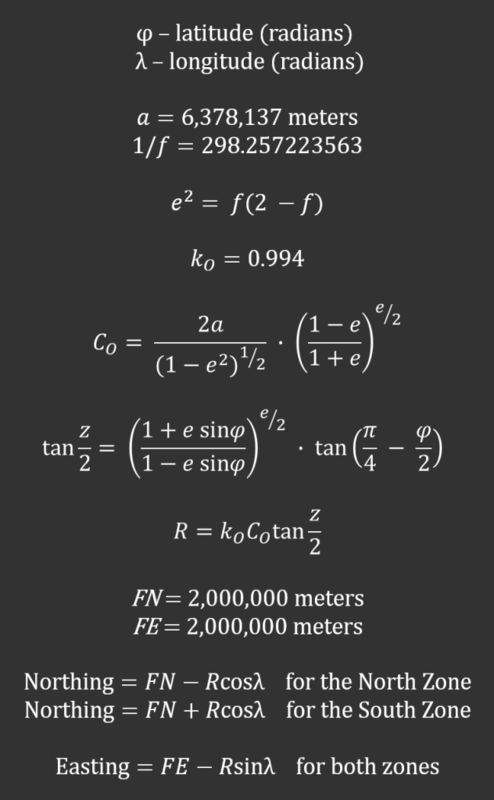 If you are coding up an algorithm that consists of a series of well-known equations in a certain field of study, and the more your code looks like those equations, the easier it is to check it against the literature. It’s not perfect: you still cannot set numerators above denominators, for instance. But isn’t that easier to compare to the literature than if we had to write out RsinLambda or eSinPhi? Last week, we looked at List.headOption. If you don’t need the first item in a list, but rather the last item, the counterpart of List.head is List.last. Likewise, the counterpart of List.headOption is List.lastOption. This post claims to be about Array.last and Array.lastOption. Why all the talk about List.lastOption? First, as you have probably noticed already, just about any method available on one sequential collection is available on them all. That is, if there’s a List.last, for example, then there’s also a Seq.last, an Array.last, and a Stream.last. Second, I want to point out a potential pitfall of using last and lastOption. Both the size and type of the collection can affect the performance of your program or even crash it. Arrays give you O(1) access to their elements. (In case you’re not familiar with it, that’s called “Big O notation.” It’s a way of expressing how long an algorithm takes to execute.) That is, arrays give you nearly instant access to any element—first, last, somewhere in the middle—doesn’t matter. Lists and sequences, on the other hand, give you O(n) access to their elements. That is, the more items in the list/sequence, the longer it takes to get to the one you want because the machine always has to start at the first element and iterate through every single one until it gets to the one you want. No big deal if there are only 100 elements, but if there are 10,000,000 elements, fetching the last element will take a while. You don’t have to eschew last and lastOption. Just take into account what kind of collection you’re calling them on. Array.last and Array.lastOption are perfectly safe. (Well, do remember that Array.last throws an exception if the array is empty, but with regard to performance, it’s fine.) But before you call last or lastOption on a list or a stream, make sure you know how big it is, or you could, as they say, shoot yourself in the foot. Sometimes you need to get the first element of a list. No problem: List.head to the rescue, right? But what happens when you call List.head on an empty list? Yeah, I’m not wild about those options either. Speaking of options, what if you had a method that returns a None if you ask for the head of an empty list? If the list is not empty, it could return a Some containing the value of the head element. List.headOption does just that. Now when might you actually use something like this? Perhaps you want to determine the top salesman each day, but only if the salesman has reached a certain threshold, say, $10,000. You can filter out the salesmen who don’t reach the threshold, sort the list of salesmen according to end-of-day sales totals, and then try to take the head element. If no one makes the cut, then the filter operation returns an empty list, which ultimately yields a None. Filtering over a sequence of values omits values that do not meet certain criteria. 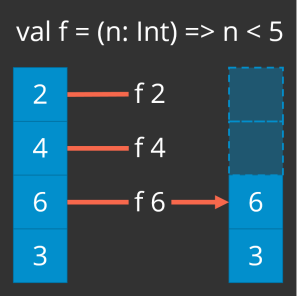 Mapping over a sequence of values transforms each value into another value. What if you could do both at the same time—filter out unwanted values, but transform the ones that are left? You can with Stream.collect. But first, you need to know about partial functions. 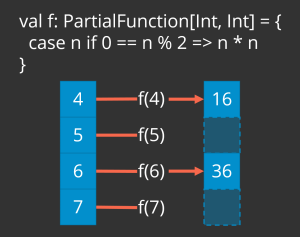 A partial function is a function that has a limited domain, i.e., is not defined for every possible value of its input type, but only a subset. The classic example is division. Division is undefined for a divisor of zero. In other words, m &div; n is valid unless n = 0. So then, division is not defined for every number n. In this particular example, that’s not a big limitation on the domain, but it is nevertheless a limitation that prevents us from saying that division is defined for every possible n.
Therefore, remember to check the domain of a partial function before applying it to a given input. A responsibly crafted API that accepts partial functions from you will verify that an input is in the partial function’s domain before applying it. Whereas Stream.filter takes a predicate—a function that takes a value and returns a Boolean—Stream.collect takes—you guessed it—a partial function. Stream.collect checks each element of the stream to see whether it is in the partial function’s domain. 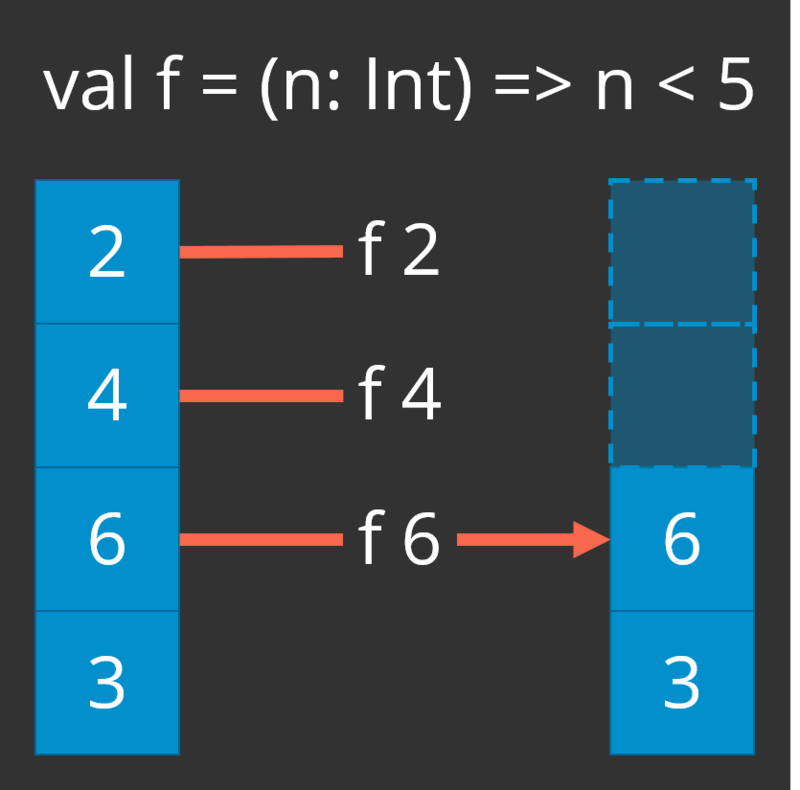 If the partial function is not defined for the input element, then Stream.collect discards it. 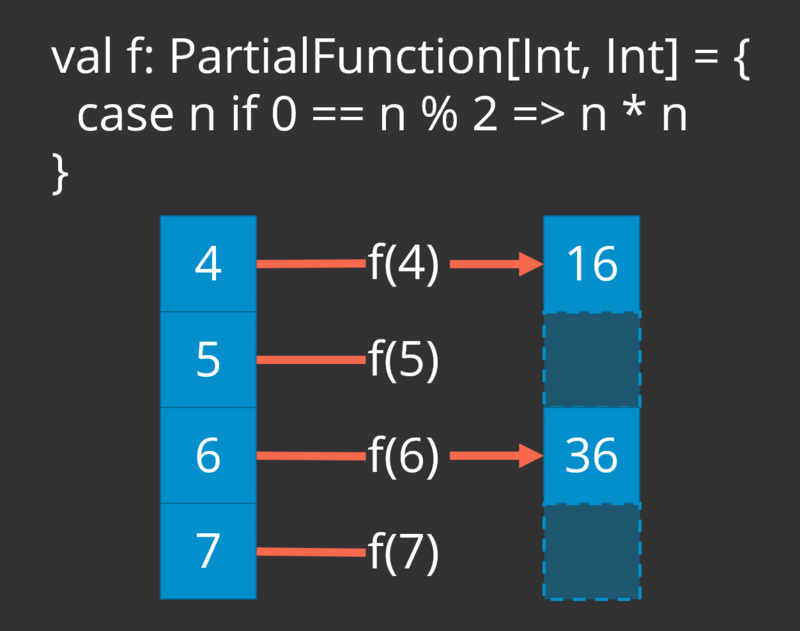 If the input is within the partial function’s domain, then Stream.collect applies the partial function to the input element and returns the result as the next element in the output sequence. Another method Stream offers is Stream.grouped, which divides a stream’s elements into groups of a given size. This time, instead of having to calculate the number of elements to skip in order to skip n pages, you first use Stream.grouped to turn the stream into a paged recordset; each “page” is n records long. Then drop page - 1 pages in order to get to the page of records you want. Finally, calling Iterator.next is necessary because, remember, Stream.grouped turns a flat stream into a stream of streams. I will admit that I find it irritating that Stream.grouped returns something that does not have a head method. Calling Iterator.next, while just as easy, is inconsistent with collection semantics. It seems to me that Stream.grouped ought to return a collection rather than an iterator. Perhaps there was once a reason for returning an iterator instead of a collection, but it would be nice if we could fix that. Scala Saturday today is short and sweet: Stream.distinct. Stream.distinct removes any duplicate members of a stream, leaving only unique values. That’s fine if you don’t care about preserving the order of the items in the input stream. Just as the analog to Stream.take is Stream.skip, the analog to Stream.takeWhile is Stream.dropWhile. That is, when you don’t care so much about dropping a certain number of items, but rather a certain kind of items. Assume you have the same temperature sensor as the one in my post on Stream.takeWhile. This time, instead of once per minute, assume that it feeds you temperature readings once per second. Add to that the idea that the sensor has a few seconds of boot-up time in which it sends you -1000.0—the indication that the current reading is invalid—until it has fully booted and can start sending good temperature data.